On one of my many window shopping trips to browse the ASOS website, I came across a couple of pink items that I just had to have and ordered them immediately as I knew that they’d look awesome together with an otherwise all black outfit. A few weeks in and I have to say that my Monki Lollo Poncho has quickly become one of my favourite pieces in my wardrobe. The great thing about this pieces is that it truly is ‘one size fits all’ like it says in the label. Usually that means it’ll fit sizes 8 to 14 but I’m far larger and it fits me perfectly. I think that it looks great and would suit so many girlies out there regardless of their size. It features this patchwork style pattern of baby pink, black and grey and it is a warm but very lightweight piece making it a perfect transitional item for the weather that we’re having at the moment. 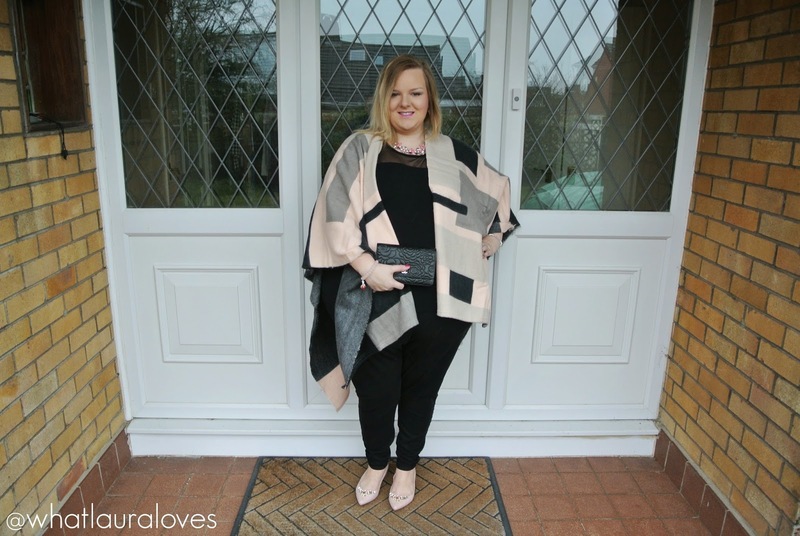 I love how I can wrap this around me and snuggle up when I’m at the cinema but it is equally suited to laying loosely over my shoulders as part of a smarter outfit like I wore in these photos. 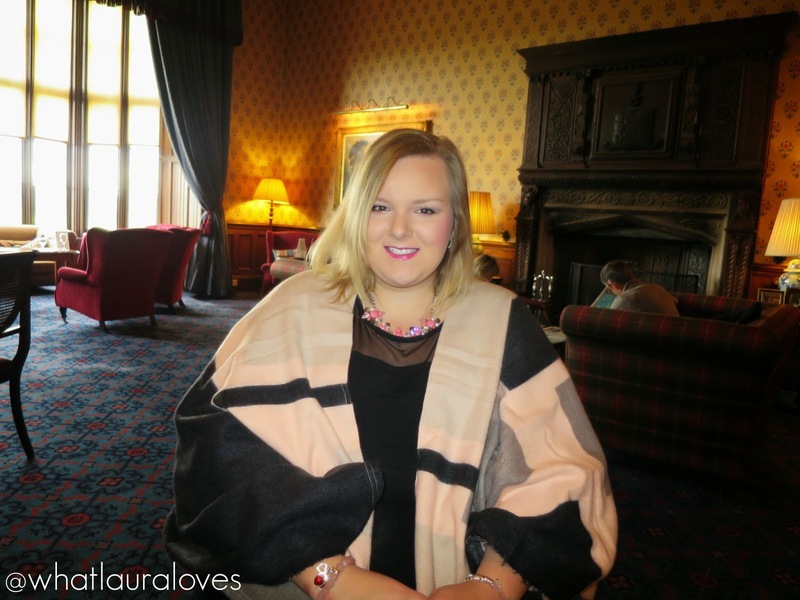 Mr WLL was taking me out for Sunday lunch at our wedding venue in the countryside and while I knew that I would want to be wrapped up warm, I wanted to look well dressed and put together too. Underneath I’m wearing one of my favourite tops to wear to smart daytime occasions. Its from Boohoo and it is a classic black top with a sheer mesh panel at the top which makes gives it an instant upgrade from a casual t shirt to a smart top. I’m wearing it with my uber comfortable black jeggings which are an absolute staple in my wardrobe, although by now, I’m sure that goes without saying! I love to pick out colours from within my outfit and wear complimentry accessories. 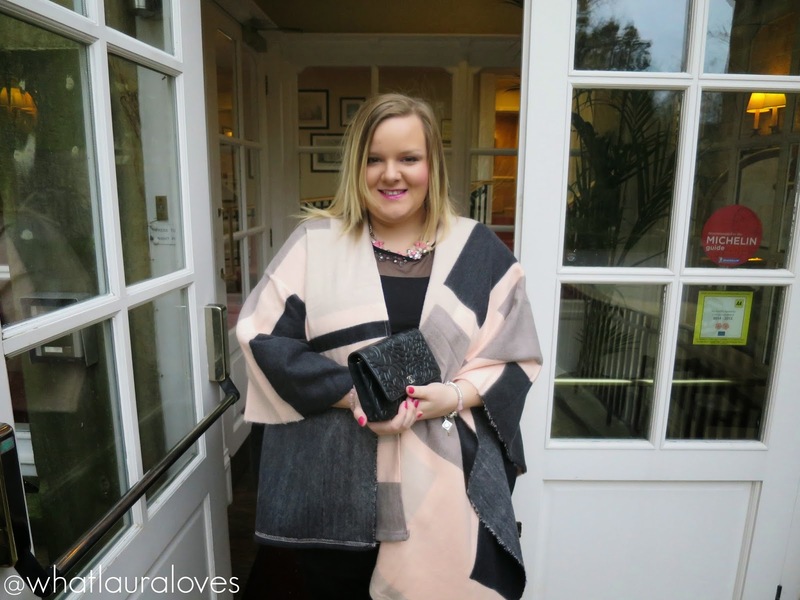 Pink was the obvious choice to pick out from this poncho and I love the statement necklace from Next that I chose to pair with this outfit. It was given as a birthday gift last year and I’ve had so much wear out of it already. It is such a feminine, girlie piece and goes with so much of my wardrobe. The earrings I’m wearing are ones that I picked up in Barbados on honeymoon and my bracelet is a Thomas Sabo pink stone charm bracelet. I have the strawberry, diamante heart and the wedding rings charm on mine. I’m also wearing my rose quartz Sweetie Bracelet by Links of London with my two graduation charms and a heart charm on it. I love all of my charms because they remind me of a particular point in my life and are always given with such love. 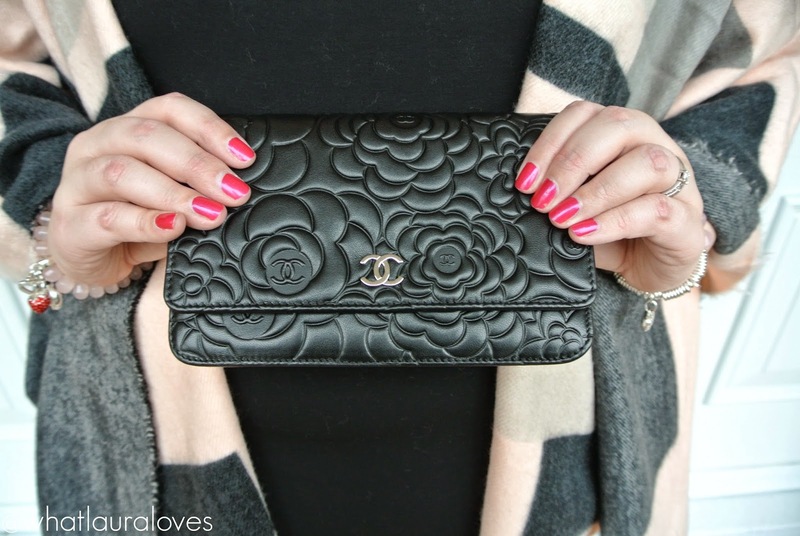 The bag that I decided to take with me was my new Chanel Camellia embossed WOC that I received as a Valentines gift. I think the beauty of this piece speaks entirely for itself and I feel like a total princess whenever I carry it. To compliment the pink in my poncho, I simply had to wear my new Faith Garden Embellished Flat Pointed Shoes that I bought at the same time. These are simply stunning. I am in LOVE with them. They have a very slight heel, a pointed toe, pink mock snake skin and the most beautiful jewelled embellishment that I’ve seen for a long time. I couldn’t recommend these more highly enough, they’re stunning girls! How would you style this poncho? That's such a cute outfit-ponchos for the win! oh that poncho looks so cozy. I love the colours! That cardigan is so cute. It always works on other people but on myself I don't quite know how/when to wear them. I feel like they don't offer enough coverage or warmth for winter and they're too hot for spring. PS: The necklace is beautiful too.